Lucky you. You’re heading to the Caribbean! You’re sure to have one of the best times of your life. Let me help you make it even better by ensuring that your skin is properly protected during your trip. The Caribbean is a tropical climate where the sun’s UV rays have a more direct angle to the Earth’s surface. That is why you need to be vigilant in your sun protection. UV protective clothing, hats and sunglasses, and seeking shade whenever possible, are all important things to focus on. But the most important thing for your skin exposed to the Caribbean sun is a quality sunscreen! Finding the ideal sunscreen for your skin and specific needs before you head to the Caribbean will give the peace of mind you need to really let loose and enjoy every moment of your vacation. Whether you’re there for a long or short stay, going on a Caribbean cruise, staying at a resort, looking for a Costa Rica sunscreen, SimplySunSafe will guide you in the right direction to begin your sunscreen search! After thorough research into what is needed to protect your skin in the Caribbean sun, SimplySunSafe recommends BADGER Sport Sunscreen SPF 35 as the best sunscreen for the Caribbean. Keep reading for a detailed buyer’s guide, comparison table, and in-depth reviews of the top 5 sunscreens to use in the Caribbean. If there is one thing that I always want you to remember when searching for sunscreen is that you need broad spectrum protection. What does this mean exactly? It ensures that you are properly protected against both UVA and UVB rays from the sun. Each type of ray works differently which is why protection against both is necessary. UVB rays damage the outer layer of your skin causing you to tan or burn. UVA rays penetrate the dermis (deepest layer) of your skin altering DNA and causing premature aging. Exposure to both types of rays greatly increases your risk of getting skin cancer so you want to be sure you are sufficiently protected from both. This is especially true in the Caribbean where the sun’s rays hit the Earth at a more direct angle than other places. Don’t worry about finding broad spectrum protection, as it is widespread now. Just keep in mind that if you are not sure whether or not a sunscreen offers broad spectrum protection, there are two easy ways to check. Search the label for the words ‘broad spectrum’ or ‘UVA/B’ which make it clear that the kind of protection you need is offered. You can also check the ingredients list for zinc oxide. Sunscreens with zinc oxide are always a safe and effective option, as they protect against the full range of UVA/B rays! The mysterious Sun Protection Factor (SPF) – what does it really mean? It’s one of those things that everyone understands to a certain extent, but not in great detail. It is an important factor in choosing the right sunscreen, especially for the tropical Caribbean sun. The simplest way to explain it is that the SPF tells you what fraction of the sun’s UVB rays (SPF doesn’t concern UVA rays) will reach your skin when your sunscreen has been properly applied. For instance, if you are wearing a sunscreen with an SPF rating of 30, then 1/30th of the sun’s rays will reach your skin. It makes sense now that we can stay in the sun longer when we wear sunscreen, right? Don’t get overexcited, though. Wearing a sunscreen with an SPF rating of 30 does not mean that you will be able to spend 30 times longer in the sun than if you weren’t wearing sunscreen. A lot of different factors influence the effectiveness of SPF, including the time of day, the amount of properly applied sunscreen, and even reflections from surfaces like sand or the water. Are you as surprised as I was when I first learned the truth about SPF ratings? As you can see, there is really very little difference between an SPF rating of 30 and one of 100. Along with the FDA, SimplySunSafe recommends that you always choose sunscreens with an SPF rating no lower than 30 and no higher than 50. Remember, reapplying your sunscreen at least every two hours is a must, not a suggestion, no matter what the SPF rating! Did you know that sunscreen can be separated into two groups based on their active ingredients and how they work to protect you? There are many features that make physical sunscreens a better choice than chemical ones. Physical sunscreens work immediately upon application, last longer, they’re less likely to cause irritation, and they have a longer shelf life. There is also one very big problem with chemical sunscreens. They often contain dangerous ingredients that mess with your hormones! The worst of these ingredients is called oxybenzone. Although it is still legal, the EWG has expressed major concerns about the ingredient. Here at SimplySunSafe, we never recommend products containing oxybenzone. Better to steer clear of it! The safest and best sunscreen for the Caribbean sun will be a physical one! As you’re preparing for your trip, take some time to think about what your days will look like. The Caribbean sun is strong. Any extended period of time spent outside likely means that you will be sweating. But let’s be honest. 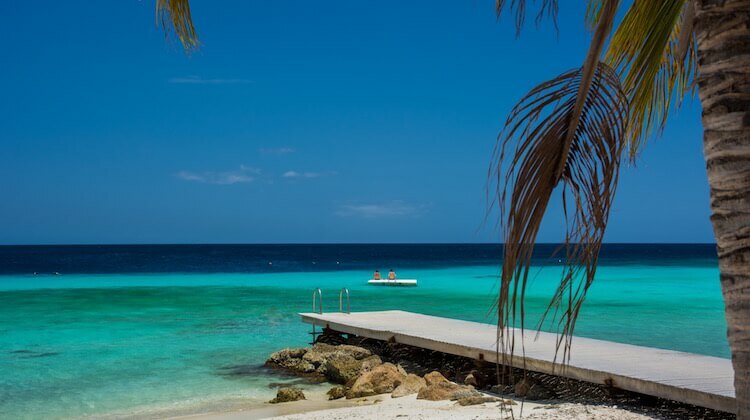 One of the biggest lures of the Caribbean is its beaches. Chances are you’ll be spending a lot of time on them and in, or at least, near the crystal blue waters. That brings me to my next suggestion: water resistant sunscreen. Even if you are not a big swimmer, the best sunscreen for your Caribbean vacation will be water resistant. Whether it is due to water activities, your skin will get wet, and you don’t want to be left under protected and vulnerable to the sun’s UV rays. When searching for your water resistant sunscreen, don’t be fooled by superfluous marketing. ‘Sweatproof’ or ‘waterproof’ sunscreens do not exist. Sunscreens are made with either 40 or 80 minutes of water resistance. For the tropical Caribbean sun, I recommend that you choose one with 80 minutes of water resistance. I’m sure that it doesn’t come as a surprise for you to hear that wearing sunscreen every day in the Caribbean is an absolute must. With the strength of the sun’s UV rays, you simply can’t risk going without it. So you need to find a product that fits into your daily routine. Do you want to use one sunscreen for both your face and body? What skin sensitivities or conditions do you have? Will you wear make-up over your sunscreen? Having your skin’s unique needs in mind will aid your search process! A sunscreen that will be used daily should be gentle on your skin and not cause any irritation. All of the sunscreens recommended here are effective options that will work well for daily use in the Caribbean! Spray sunscreens seem like a practical and convenient idea when you’re looking at the bottle. The problem is that they are simply not as safe or effective as rub on lotions. Spray sunscreens present a safety issue because it is very easy to inhale chemicals that are meant for your skin, not your lung tissue. Besides safety, you just won’t be as effectively protected with a spray sunscreen. You can’t have full control of proper (thick and even) application of your spray sunscreen like you would with a rub on product. It’s not worth the risk! Choose a rub on lotion that takes a little extra time to put on over a spray sunscreen for the best sunscreen for a Caribbean cruise! After exhaustive research into the specific needs for sun protection in the Caribbean which included discussing issues with customers, reviewing customer feedback, examining manufacturer specifications, and participating in skincare forums, SimplySunSafe has determined the best 5 sunscreens for the Caribbean. Each of the following recommended products provides physical, broad spectrum protection for your skin at an SPF rating of 30 or higher. They are all free of oxybenzone and water resistant for maximum protection! 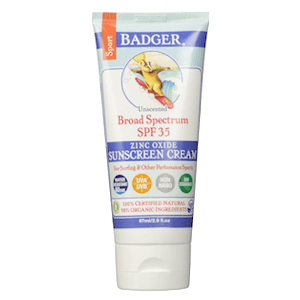 Surely, one of the best sunscreens you will find on the market in general, BADGER is an ideal choice for protection in the Caribbean. It is a simple, gentle, yet effective sunscreen with a high concentration of active ingredient zinc oxide (22.5%), providing you with the most effective broad spectrum protection. BADGER’s formula is made of a total of five natural ingredients, which will leave your skin gently protected on a daily basis. You will need to make sure to rub the thick formula in well because the high concentration of zinc oxide can leave a white cast, sometimes. But you can always cover that up with some make-up, if you want. Your 80 minutes of water resistance will be durable. BADGER will support the sweating and water activities of your Caribbean days. Another great thing about this product is that it is biodegradable and environmentally friendly so you won’t be doing any added to damage to the beautiful Caribbean waters! BADGER can protect your whole family in the Caribbean. Check out their kids and baby products, which are of the same high level of quality and effectiveness! Thinksport is another strong and effective option for the mighty Caribbean sun. Broad spectrum protection is yours with a 20% concentration of zinc oxide (20%). 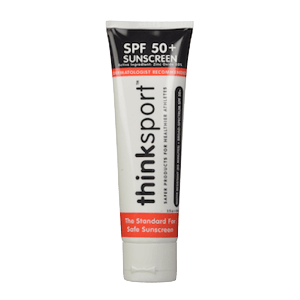 The first sunscreen to pass the Whole Foods premium care requirements, thinksport is dedicated to the safety of both users and the environment. You will be surprised with how gentle this formula is on your face and body despite being sport oriented. Daily use of the sunscreen will not cause any irritation to your skin. The high SPF rating is a good idea for vacationing or cruising in the Caribbean sun. This sunscreen’s reliable 80 minutes of water resistance begs you to play in the Caribbean waters! Sweating and water activity will not create issues for you when wearing this formula. That strength does come at a price, though. The formula is thick, needs to be rubbed in well, and may leave a white cast. Consider covering it up with make-up or just looking at it as a reminder to reapply! Another great option for your family vacation, check out thinksport Kid’s Safe Sunscreen SPF 50+ and thinkbaby Safe Sunscreen SPF 50+! 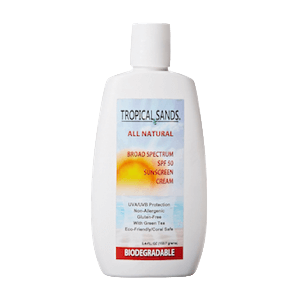 Another environmentally friendly, biodegradable option for your time in the Caribbean is Tropical Sands All Natural Sunscreen. This formula offers impeccable broad spectrum protection with an unusually high combined concentration of active ingredients zinc oxide (22.5%) and titanium dioxide (6%). Tropical Sands is gentle enough for daily use on your face and body and contains ingredients that will nourish your skin, keeping it healthy during your vacation. The light green tea scent may also add to your Caribbean experience and enhance your memories! The 80 minutes of recommended water resistance are covered by Tropical Sands All Natural. Just keep in mind that the formula is very thick and will leave a bit of a white cast. Don’t worry, it won’t interfere with you having fun, and if you want to, you can always put some make-up on top! BurnOut is another great option for protecting your skin during your Caribbean adventures. It provides broad spectrum protection with a high concentration of zinc oxide (20%). Irritation will not be an issue, even with daily use on the face and body. 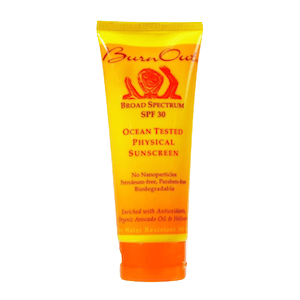 BurnOut is a very gentle sunscreen, and the aloe vera in the formula will help condition your skin. The formula is very thick and needs time and effort to rub into your skin, but it’s worth it. The thickness of the formula contributes to the durability of its 80 minutes of water resistance. Sweating and water activity will not make your life hard in the Caribbean with BurnOut. This product deserves a trial run, it could be the right sunscreen for you! The last recommendation I would like to give you for the Caribbean is Alba Botanica. It is a very effective and reliable product. Broad spectrum protection is provided with active ingredients zinc oxide (14.5%) and titanium dioxide (2%). 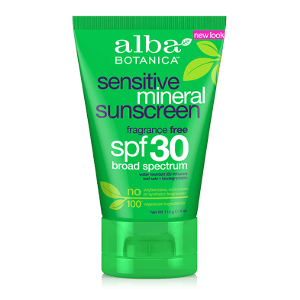 For daily use on your face and body, Alba Botanica will be a great fit. It is very gentle and will not cause any irritation. You’ll receive a combination of skin protection and nourishment! This formula also gives you 80 minutes of durable water resistance. This really is one of the most important things you’ll want to have in your sunscreen in the Caribbean! Keep in mind that the formula is very thick and takes time to rub in. Also, before applying make-up or going out into the sun, you need to allow the product about 30 minutes to dry. This may be inconvenient during your vacation, which is why Alba Botanica has taken the last spot on my list. But it is a wonderful product that is worth testing out, if it can be worked into your daily routine for the Caribbean! This guide was written for people searching for the best sunscreen for the Caribbean. Hopefully by reading this, you gained more knowledge about how to protect your skin in the Caribbean sun, and found a sunscreen that fits your specific needs. 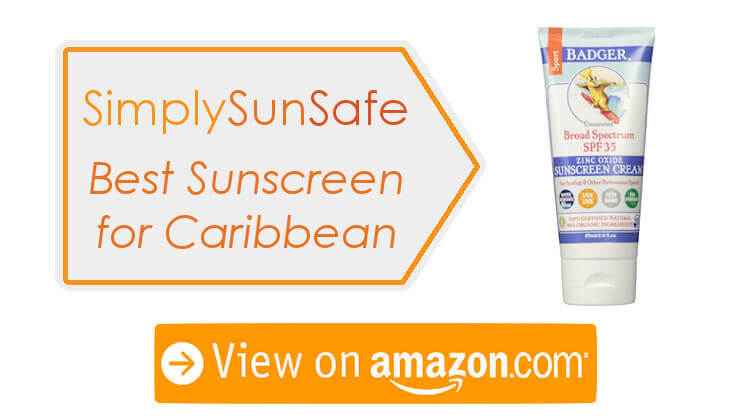 SimplySunSafe recommends BADGER Sport Sunscreen SPF 35, but all 5 sunscreens will effectively protect your skin in the Caribbean. It’s always a good idea to try out a few products before deciding on which one to use on a daily basis. By trying different sunscreens, you give your skin the chance to react to the products showing you exactly what your skin needs. Then you will be able to make the best decision for your skin in the Caribbean. If you’re heading to a tropical destination locally, you can check out SimplySunSafe’s breakdown of the best sunscreen for Florida. Learning new things and hearing about new sunscreens from others is always really exciting for me. So if you use or know of another sunscreen that is a good option for the Caribbean, please share it with me in the comments. I will take the time to check it out and maybe even add it to the list! I found your article really useful and am going to try the recommendations you made for my trip to Jamaica next week. I had real issues with the sunscreen(s!) I took to Thailand so I thought I’d do some further research this time. A lot of the articles I read didn’t focus on the unique characteristics of the Caribbean or the practicalities, as your did. It is especially important we get it right this time as we will be taking my 7 month old daughter with us, I want to make sure she is properly protected too! I will let you know how we get on!